Arctic Tern, Donegal's Inishowen Peninsula. A summer visitor to Malin Head and the offshore islands, these birds will defend their territory with venom. Photo: Ronan McLaughlin. Rónán McLaughlin's photographs of Ireland's most northerly point throw up one surprise after another. Astonishingly, most were taken within the same square mile. That's testament both to the natural wonders of Donegal's Inishowen peninsula, and the remarkable dedication of a photographer who spends hours on end waiting for the perfect shot. McLaughlin was born and reared in one of Ireland's most northerly houses, set just below the old 'Tower' that features in so many of his photographs. "My bedroom window looks straight at it, so emotionally it's very important to me," he says. 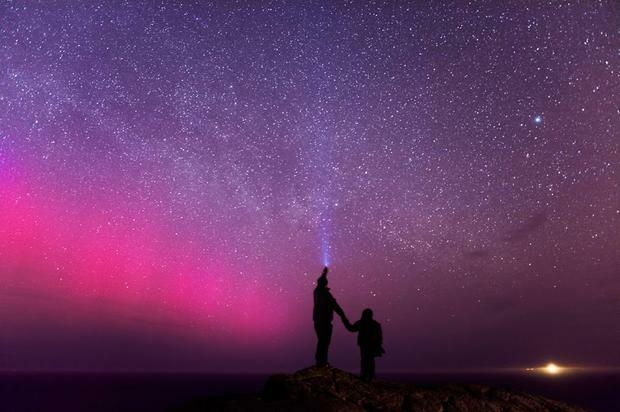 "Growing up with the wildlife, the stars and the aurora makes it a very special place to me." Many of the photos in our gallery feature long exposures of up to 25/30 seconds - allowing the Northern Lights and Milky Way to distinguish themselves. McLaughlin is also a keen bird-spotter - "I basically got into photography to photograph birds and unusual wildlife I would find. I have a love for wildlife and the night sky. "Call me biased, but I can get all I require around Malin Head and Inishowen." You can find out more about Rónán and his photography on Facebook here or visit his website at www.ronanmclaughlin.com. He is also on Twitter and Flickr.